Doncaster Rugby League Club had a tough act to follow last season but they did so with flying colours when finishing fourth. The Dons had defied all the odds in 2013 when finishing sixth in the Championship after being crowned Championship One champions the previous season. But supporters had every reason to be slightly apprehensive during a close season which saw Doncaster Rovers take over the club and Paul Cooke take over the coaching reins following Tony Miller’s decision to step down. In winning back-to-back coach of the year awards, Miller had proved that he could bring success to the club despite operating on a tight budget, whereas Cooke, although he had made a huge contribution to the Dons’ cause, was untried. There were genuine concerns that even if Cooke justified the faith that Carl Hall and Miller had placed in him on the coaching front it would have an adverse affect on his performances on the field. Yet not only did Cooke, the 2014 Championship Coach of the Year, more than live up to expections as Miller’s successor, he remained a key man on the field and only occasionally did the demands of the gruelling player-coach role look to be taking its toll. Cooke was undoubtedly helped by the success of the dual-registration tie-up with Hull, which tended to serve the club better than the previous arrangement with Wakefield. Wisely, Cooke retained the vast majority of the 2013 squad with his gamble of offering prop Craig Robinson a new deal after a disappointing 2013 campaign, really paying off. Robinson, as did fellow prop Matt Carbutt, had an outstanding season and deservedly scooped a handful of awards at the club’s presentation evening, which was timely as the club had suffered an early blow when try-scoring prop Brett Waller sustained a serious knee injury in a warm-up game and missed the whole season. 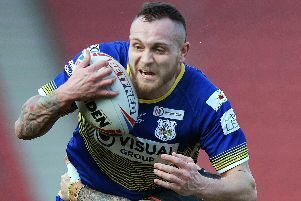 Scrum-half Danny Nicklas, who had showed up well in his debut season at the Keepmoat Stadium, was also ruled out for the rest of the campaign after suffering the same injury in late March. Cooke eventually turned to teenage half-back Richard Wilkinson, a close season signing from Hull, and he went on to grab the chance with both hands. Though still not the finished product, Wilkinson looks to have a bright future in the game. He’s a clever footballer with an eye for a gap and he’s not afraid to back himself. Few would probably have predicted at the start of the season that Mick Butterfield would not only lose his place but be allowed to move on. But that is exactly what happened as former Featherstone winger Dave Scott made the full back role his own with a string of outstanding displays. Fellow newcomer Steve Snitch also proved a shrewd signing, as did the raw but exciting Pasqualle Dunn. The likes of Stu Sanderson, Kyle Kesik and Mike Emmett all continued to give excellent service.